URETEC specialises in polyurethane processing for manufacturing components for industrial applications. The company initially produced machinery components for the paper, mining and extraction industries, including screening sheets and cones. It now produces a vast range of customised, durable polyurethane components. The experience gained by URETEC over the years makes it a key parts manufacturer for sorting and screening processes, as well as other technical applications. Polyurethane processing requires specialist technical resources, in order to guarantee the maximum precision during all stages of the processing cycle with the support from adequate production structures. URETEC has its own internal mechanical workshop. Thanks to the synergy with its partner, Sicma, the company not only supplies the moulds and the processing of polyurethane coatings, but also provides metal carpentry, inserts to be coated and any other mechanical finished and processed component. Thanks to it being wear and abrasion-resistant, polyurethane is particularly suited for the production of components used for the selection and washing of inert materials, such as vibrating and rotating screens. 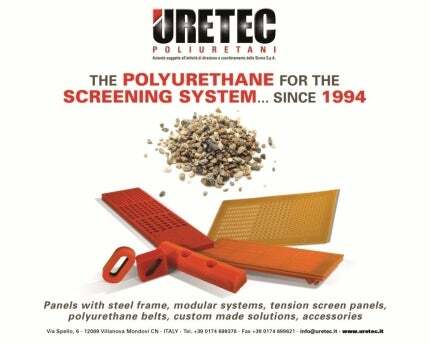 URETEC produces a large number of polyurethane components such as screening sheets, drying panels with injection frames, wire-tensioned frames and modular panels with different types of fastening profiles. We also manufacture mixers for moving materials, various forms and sizes of sheets for sliding channels, nozzles, hydro-cyclones and dryers for the washing and separation of water and sand, worm screws and scrapers. It also has a complete range of accessories such as discs for star screens, wheels for rotating screens, raw plugs, wedges, adapter profiles and general wear-proof components. URETEC was founded in 1994 in collaboration with Sicma and other operating partners. Thanks to our partnership with Sicma in 2010, URETEC has acquired a greater and complete production capacity and offers its own clients a wider range of services, which vary from the design to the development of customised solutions in compliance with the various requirements. URETEC specialises in processing polyurethane materials for the realisation of elements to be used for industrial applications.